BB, CC, DD…all of a sudden makeup shopping feels way to much like bra shopping! I don’t know about you but I am always in search of the perfect bra that fits like a glove, lifts, smooth’s and supports you all the while manages to make you look 15 pounds thinner and 10 years younger. So…having said all that I guess looking for the Holy Grail beauty products is just like shopping for a bra! I’ve been resisting the BB Cream bandwagon! Despite the reviews and buzz they are getting in every corner of the beauty industry I’m just not sold. I’ve tried them, I’ve tried to love them…but I just keep coming up empty in my search for a BB Cream that works well for my skin type and my life style. Now cue the CC Cream parade! 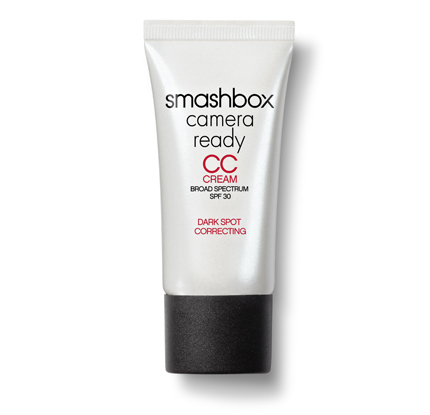 Smashbox touts their CC cream as the quick fix for brightening skin, evening out complexion, fading sunspots, dark spots and even acne scaring. Now that’s a lot…but that’s not all! In addition this product primes, perfects and protects your skin. It’s equipped with SPF 30, which is a must for any beauty looking to protect her moneymaker! I am all about a good primer under my foundation so one with all those added benefits feels like a fantastic idea! I topped my CC Cream look off with Smashbox’s Halo long wear blush in Blissful and Bronze. Blissful is the perfect flushed raspberry hue for my fair skin and Bronze gave me a subtle contour and warmed up my face with a sun kissed glow. This product won a 2013 O-wards from Oprah magazine and I can see why! These blushes are buildable, blendable, highly pigmented and the long wear formula is no joke! I used the Photo Op eye shadow trio in Litho for my eye look and found it to be pigmented, blendable, and velvety smooth. I can attest to the long wear performance as well! I found this trio to be a mix of warm and cool tones that works for an easy neutral smoky eye that can go from day to night. Thanks Smashbox for pulling me into the CC Cream trend and brightening up my dull skin with your CC Cream and Halo long wear blush! Those both feel like they will be excellent additions to my makeup routine! Previous First look and first impressions of the Brand New Wayne Goss: the eye set brushes!!! Next The Glitter Report!!! March Favorites!!!! !